The Offshore Elite includes two large, independent buoyancy chambers each over 11″ round as well as an automatically inflated canopy. Offering a spacious 4 square feet per person, the Offshore Elite also includes a boarding ramp as opposed to a ladder making it much easier to enter the raft in rough sea conditions. The Offshore Elite also includes an inflatable floor, stowage pockets, zippered windows, flashing strobe, extra large ballast pockets, an extensive equipment pack including USCG/SOLAS flares plus much more. 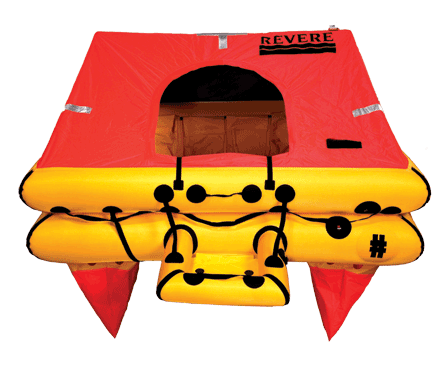 A training DVD comes with the raft to help you and your crew prepare for use in an emergency situation. The Offshore Elite is vacuum-packed to add greater protection against the environment and minimize servicing costs as service is required just once every three years. If serviced according to manufacturer’s specs, the Offshore Elite offers a 12 year warranty.